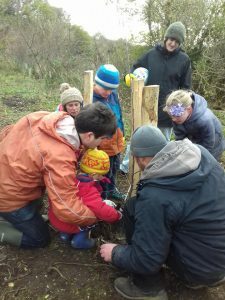 Over the winter Brighton Permaculture Trust planted 86 fruit trees with local partners at nine locations. Here’s an update on the various projects we’ve been involved with this winter (2018-2019). This winter we planted another four apple trees at Racehill Community Orchard. Two Sussex apple varieties were planted and two “Feuille Morte”, a very late flowering variety which spreads the flowering season to reduce the risk of a poor crop due to bad weather. This adds to an orchard of over 200 trees, which we believe to be the largest traditional orchard to be planted in Brighton & Hove in a century. We are running regular activities and workdays at Racehill Orchard for volunteers. This planting was funded by the Rampion Fund at Sussex Community Foundation. Two apples, a plum, a fig and a walnut were added to the orchard of over 100 fruit trees planted around the estate. A Stanmer Pippin apple was added to the 5 trees planted at the community garden two years ago. This tree was planted in memory of Dan Woods, a talented artist and musician who loved Dyke Rd Park. The planting was part funded by Infinity Foods. Two rare Sussex apple trees, Lady Hopetown and Mike Rowney, were planted as part of our National Collection of Sussex apples. The trees were planted during the Planning and Planting a Small Orchard course. Working with Peacehaven Community Orchard, we are close to completing an orchard which will extend to over 100 apple trees. This winter we planted a further 19 apple trees of 11 varieties. Seventeen of these trees are Sussex apple varieties and the orchard will contain all the Sussex varieties, once completed. We are installing a 1.8m high shelter around each tree to shelter it from the wind in the early years. We planted a shelter belt of over 2,000 trees of 33 species a few winters ago. These included fast-growing species such as Italian alder and Monterey pine; native trees like oak and beech; nut-bearing species such as walnut and chestnut; and fruiting species like cherry plum and crab apple. Fifteen of the trees planted this winter were planted in partnership with Trees for Cities and these were funded by Mothercare. The remainder of the trees were part funded by Infinity Foods. An 10-tree orchard, comprising 3 apples, 3 pears and 2 plums, a fig and a mulberry, was planted with the pupils. The orchard is part of wider project to develop the school grounds as an outdoor learning environment that Brighton Permaculture Trust is helping with. This orchard was funded by Infinity Foods. A 12-tree orchard, comprising 12 different Sussex apples was planted on a rainy day in December. Ollie Pendred’s article tells the tale. An 8-tree orchard, comprising 5 Sussex apples, 2 pears and a plum, was planted with the children in February. Working with Brighton Permaculture Trust, the estate continued with the creation of a collection of Sussex apples adjacent to a public footpath. The collection will act as a valuable second location for the National Collection of Sussex apples and will contain two trees of each of the Sussex apple varieties. Last winter, a further 21 Sussex apple trees were planted, also 3 pears and a quince. All orchards were planted in partnership with local organisations. Much of the planting would not have been possible without the dedication and hard work of our volunteers or other volunteer groups. Sign up to volunteer with us.